Why should I choose Family Fertility Center? What can you tell me about your physician and staff? What will be done at an initial consultation? What needs to be done before I discuss further options with the fertility specialist by the female and/or male partners? Do you help women who have already tried IVF, have not conceived but want to try again? Do you accept the insurance I have? Are you open for early morning appointments and on weekends? What is the treatment for infertility? What is the single most important factor for success in infertility treatment? What are your treatment options for patients over 40? What are the treatment options for women over 45? How much does a typical IVF cycle cost? What is the timeline for IVF? Should I have a Day 3 embryo transfer or a Day 5 (blastocyst) embryo transfer? Why is your IVF success rate higher (or lower) than other clinic? Isn’t a bigger IVF clinic better? If center-to-center comparison of success rate is not valid, then what is the value of clinic success rate? At less than 35 years of age, the cumulative live birth rate per cycle of IVF start is almost 50%. At 35-37 years of age, the cumulative live birth rate per cycle of IVF start is over 30%. At 38-40 years of age, the cumulative live birth rate per cycle of IVF start is about 20%. At 41-42 years of age, the cumulative live birth rate per cycle of IVF start is about 10%. At 43-44 years of age, the cumulative live birth rate per cycle of IVF start is 3%. Absolutely. We treat many patients who have had previous IVF cycle failures. One of our specialties is the ability to evaluate and treat these patients/couples. While some programs have “standard” protocols, we recognize the unique aspects of each patient and how different stimulations and protocols may have differing effects. At the Family Fertility Center, we pay particular attention to your individual infertility factors, how you’ve responded to prior cycles and integrate the clinical and laboratory aspects of care. Infertility affects about 7.3 million women and their partners in the U.S. — about 12% of the reproductive-age population (Source: National Survey of Family Growth, CDC 2002). Having difficulty to conceive is stressful enough. Finding the right place to get help doesn’t have to be. What constitutes the “right place” depends on what matters most to you. If you are looking for an established successful practice with an infertility specialist having a distinctive credential and well-known for her attention to detail, and a compassionate, supportive staff caring for you in a friendly, patient-centered environment, then Family Fertility Center is the right place for you. Our mission is simple: to assist couples and individuals to realize their dreams of parenthood. How we deliver our care is what sets us apart. Take your time, browse around our website and get to know more about us, the services we provide, our success, insurance coverage and cost for infertility treatment, and where we are located. Be sure to read the unsolicited testimonials from our patients. Give us a call at (610) 868-8600 if you have more questions. The objective of infertility treatment should be the birth of a single, healthy child. Many of the treatment options presented to infertile couples, however, are associated with high risks of multiple gestations. Moreover, many couples view multiple gestations as desirable and are unaware of the risks they pose to both mother and babies. Couples should understand these potential risks before starting treatment. The ability to limit the number of embryos or eggs transferred is an effective approach to limit multiple pregnancies. The Society for Assisted Reproductive Technology (SART) and the American Society for Reproductive Medicine (ASRM) have published guidelines recommending an optimal number of embryos for transfer based on patient age, embryo quality, and other criteria. In patients with favorable prognosis and good embryo quality, SART recommends consideration to transferring a single embryo to optimize the safety of mother and baby. Click here for ASRM’s recommendation on elective single embryo transfer. In the United States, there is no federal or state law that regulates or addresses this subject. The decision regarding the number of embryos to transfer is made jointly by the physician and the patients. This decision should be based upon the best interests of the patient and the future offspring. However, ART is centrally regulated in England, and no more than three embryos may be transferred in most circumstances. In Canada, a recent Royal Commission recommended the transfer of a maximum of three embryos. Costs are dependent on the type of treatment that each person receives. Since each person’s situation is unique we cannot predict the exact price. We are more than happy to chat with you about your needs and provide you with prices and financing options. Please call to speak with one of our financial counselors at (610)868-8600. Not only a head-to-head comparison of success rates between clinics is not meaningful because practice style and patient population affect the outcome, historic success does not guarantee future result. Furthermore your individual success is dependent on your unique circumstances. It is a big leap of faith to assume clinic xyz have a 5,10 or 20% higher success rate than clinic abc, therefore you will have 5, 10, or 20% higher chance of getting pregnant at clinic xyz than clinic abc. At best, clinic success rate should be just one of the many factors you need to consider when you choose a fertility specialist. See: How do I choose a fertility specialist? Absolutely not, bigger is not necessarily better. Aside from the impersonal take a number and wait in line treatment, the one size fit all protocol and the frequently rush into IVF approach, bigger clinics do not fare better than smaller clinics when it comes to IVF success statistics. The latest available data on the question of clinic size and success came from 2008 CDC National Summary and Clinic Reports. There is NO difference in the percentage of live birth rates among clinic of different sizes for fresh nondonor eggs or embryos. No trend can be detected for live birth rates for frozen donor cycles. 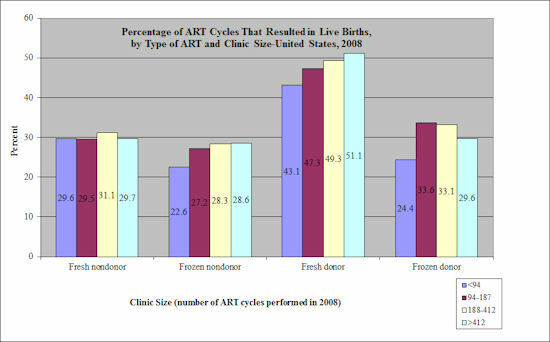 For frozen nondonor and fresh donor cycles, the percentages of cycles that resulted in live births increased as the clinic size increased. Treatment for infertility is dependent on the cause(s) of infertility. There can be one or more reason(s) for a couple’s infertility. Examples of causes for infertility include male factor such as low sperm count or low motility, irregular ovulation, endometriosis or decreased ovarian reserve. Ovulation induction with medications may be appropriate for women with irregular cycles, while artificial insemination (IUI) may be needed for mild to moderate male factor infertility. Most infertility cases, 85-90%, are treated with conventional medical therapies such as medication or surgery. While vital for some patients, in vitro fertilization and similar treatments account for less than 3% of infertility services, and about (or approximately) seven hundredths of one present (0.07%) of U.S. health care cost. The principal indication for Day 5 or blastocyst transfer is the reduction of ART-associated multiple pregnancy. Approximately 40% to 60% of fertilized oocytes reach the blastocyst stage using contemporary culture systems, but there are remarkable variations in a patient’s ability to produce blastocyst. A risk of attempting blastocyst transfer is the possibility that no embryos will be available for replacement. It is best to check with your fertility specialist to discuss your particular situation. NEJM 2004 vol 351:1927-1929 Linda J. Heffner, M.D., Ph.D.
Advanced Maternal Age – How Old is Too Old? This study is based on 10 different populations living between the 17th to 20th centuries that did not use contraceptives. Fertility remains relative stable through 30 years of age, at more than 400 pregnancies per 1000 exposed women per year, and begins to decrease substantially to less than 200 at 40-44 years of age. By 45 years of age, the fertility rate is only 100 pregnancies per 1000 exposed women. At the same time miscarriage, spontaneous pregnancy loss before the 20th week of gestation, increases from 10 percent at 20 years of age to 25 percent at 35-40 years of age, and finally to an astonishing rate of more than 90 percent among women 45 years of age or older. The chances for pregnancy using your own eggs, when over 45, are so low that we do not believe it is in your best interest to proceed with treatment, however, you may be an ideal candidate for oocyte donation. Based on years of research on age and fertility, it is very clear that the impact of age is on the oocyte (egg) and not so much on the uterus. Your ability to carry a pregnancy is unaffected by age up to perhaps the late 40s and early 50s. Of course we need to evaluate your uterine response and more importantly to assure pregnancy is safe for you and your baby. Testing about your cardiovascular system and your general health conditions are integral part of the preparation prior to IVF donor oocyte. Oocyte donation allows women over the age of 45 to experience the entire process of pregnancy, the bonding that occurs with pregnancy, the ability to breast feed and the potential to share the pregnancy with your partner. At the Family Fertility Center, 20-25% of our patients are over 40. We understand the unique requirements of this special group. Our team works with you to understand your individual potential for success. We will perform IVF for patients up to 45 years of age. It is extremely important for each patient to understand her own individual potential for success. Our goal is to give you the information you need, to optimize chances for success by individualizing care, to provide you with compassionate support, and then to give you the autonomy to make the choice best for you in all circumstances. It is not necessary to have any testing before you visit our Center. During an initial consultation for either the man or woman or both, we can review any previous testing, your medical history and determine next steps. Some patients come to us having no prior fertility workups while others seek out our care having received care elsewhere. We will start with you where ever you are and work together to determine the best possible plan for your situation and needs. Click here for more information: Why should I choose Family Fertility Center? The strongest predictor of success is a woman’s age with the number of pregnancies decreasing as the age of the woman increases. As women get older, the health of an individual egg and the number of eggs available decline-both contribute to the decrease in success rates. Also, as women get older, the chance for miscarriage increases such that live birth per cycle will decline even further. Click here for more information on Age and Fertility. The most successful IVF is one that is planned. We spend time prior to the IVF cycle gathering all the information needed to assure the treatment plan devised is most appropriate for each individual patient/couple and that all controllable factors are optimized. Once a protocol is selected, the timeline is anywhere from 4-6 weeks. The last two weeks are the most intensive with frequent office visits and procedures. And, the hardest part of an IVF treatment is the two weeks after the procedure is over – waiting for the results! This is a time when it’s important to really take care of yourself and knowing it will be stressful allows you to be most prepared. Both CDC and Society for Assisted Reproductive Technologists (SART) maintain that head-to-head comparison between clinics is not meaningful without considering the patient population and the practice style. Following is just a few selected examples of how different practice style and patient population affect IVF success rates. How much effort does a clinic put into its non-IVF treatment program? Paradoxically, the more sloppy a clinic is with its non IVF program, the more likely it will be “rewarded” with patients with favorable prognosis for its IVF program. Ironically, there is more incentive for clinic to work less hard for its non IVF cycles. How willing are the patients of a particular clinic to go through more non-IVF treatment cycles? In other words, are the patients going through IVF in a particular clinic would have got pregnant without IVF in another clinic? This is dependent on the practice style of the clinic as well as the socioeconomics of the area where the clinic is located. Studies have shown IVF utilization is higher in states where there are mandated IVF insurance coverage. Many patients who have IVF coverage and successfully conceived through IVF would not have gone through IVF had they lived in a state without such coverage; or they might have conceived with less expensive non-IVF treatment. 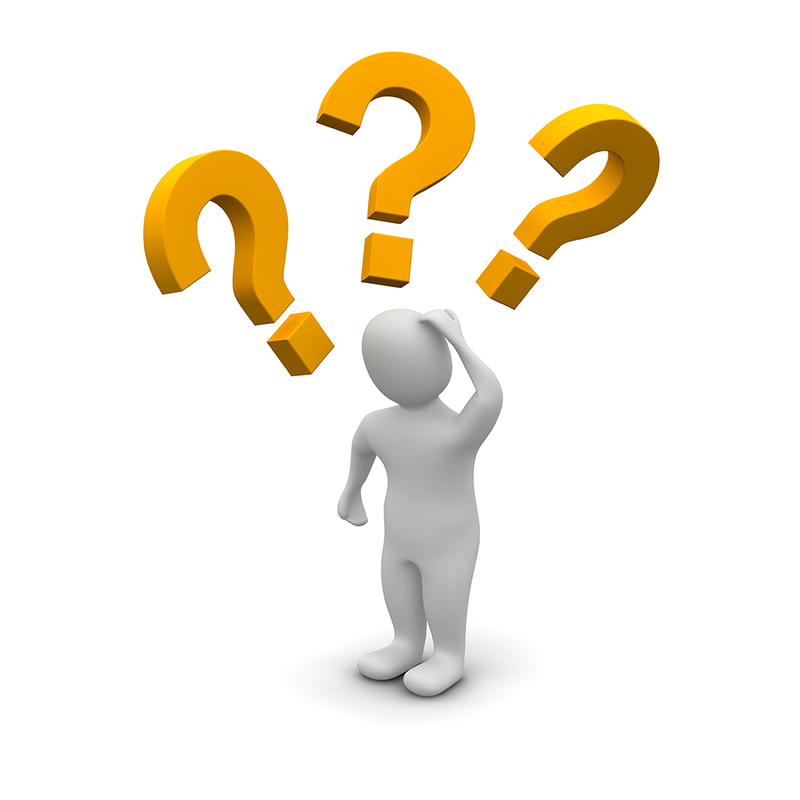 Does the clinic have an exclusion or selection process prior to IVF? A clinic that turns away patients with unfavorable prognostic test results will have a higher success rate than a clinic that has an all inclusive policy. What is the clinic’s stimulation philosophy? Generally the more gentle the stimulation, the lower number of mature follicles will result. A lower number of mature follicles yield less fertilized eggs, and less number of good quality embryos but at the same time result in less ovarian hyper-stimulation syndrome. Clinic that has a policy on more gentle stimulation or offers minimally stimulated protocols for cost saving or patient preference will have a lower live birth rate per cycle. What is the clinic’s cancellation policy? A clinic with a higher threshold requirement before proceeding with retrieval will have a higher success rate, e.g. if a clinic cancels all cycles with less than 3 mature follicles, it is likely to have a higher success rate than a clinic which does not have this cancellation criterion. What is the clinic’s policy on the number of embryos to transfer? Clinics vary in their value to avoid high order multiple gestations. Success rate alone does not reflect the percentage of high order multiple births. One simple way to check if a clinic over utilizes IVF is to compare its IVF success rate with its own donor oocyte program success. By definition, oocyte donors are fertile individuals and hence success rate of donor oocyte program serves as a bench mark that marks the highest possible success rate with IVF. If a clinic year after year has higher IVF success rate for its patients than its donor oocyte program, it is highly likely that their patients would have conceived with means other than IVF.